Ibanez ASV100FMD Artstar Vintage Hollow Body Electric Guitar in Yellow Sunburst [ASV100FMD YSL] - $950.00 : Online Music Store | The Music Store | Mesa, Arizona, All the music you can handle, delivered to your door! There's something irresistible about a vintage guitar—well worn with battle scars, earned throughout years of hard use. Like a favorite old leather jacket, it immediately feels familiar. 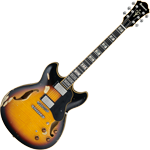 Now, Ibanez proudly offers Artstar Vintage—the alternative to pricey vintage instruments. The Artstar Vintage "aging" process applies to hardware and other appointments, as well as the body, giving each guitar a convincingly real, worn appearance. To ensure safe and on time delivery, The Music Store will ship this product via UPS only.